In a news item in Coin Update, a coin has been issued marking the grant of a new coat of arms for Ascension Island. Last August, Queen Elizabeth II approved a new coat of arms for Ascension Island, a design drawn up by the College of Arms in London. Prior to this approval from the Queen, Ascension Island used the coat of arms of the United Kingdom for official purposes. The £2 coin was issued on March 8 by the Government & Treasury of the Ascension Islands. 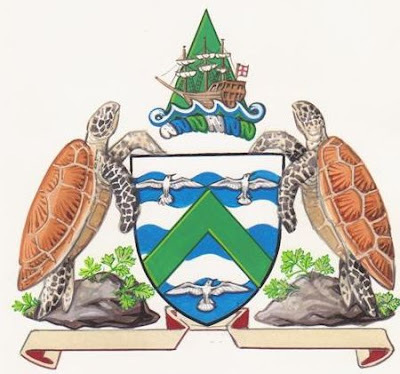 The fewer than 900 Islanders were asked what they would like to see on the coat of arms, and the design was based on the features they suggested, including the sea turtles (used here as supporters) that lay their eggs on Ascension’s beaches. Strange there's nothing written on the scroll and it does not appear on the coin.